1. Panko crusted tilapia: breaded with flour, egg, panko & fried in a pan. Soft, flaky fish with a nice crisp. 2. Parmesan crusted tilapia: breaded with parmesan cheese, paprika, parsley & baked in the oven. Simple, cheesy & flavorful. 3. 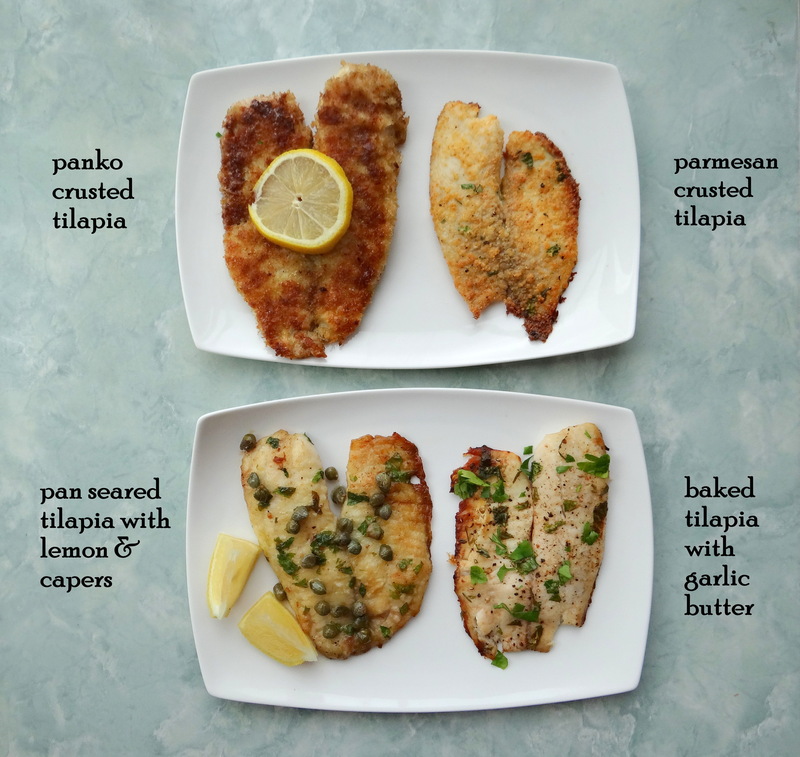 Pan seared tilapia with capers: breaded with flour, pan seared with butter, wine, lemon, capers & parsley. Love the lemony, tangy sauce. 4. Baked tilapia with garlic butter: garlic, butter & lemon sauce poured over fish & baked in the oven. Soft, buttery fish. My favorite was #3: pan seared tilapia with capers. I just love capers and fish- it’s such a yummy combo and I like the tanginess. I was quite surprised with #2: parmesan crusted tilapia. I wasn’t sure if I would like the cheese breading but it was good! It’s a very quick & simple recipe. I definitely want to eat it again. I liked #1: panko crusted tilapia for the crunchiness but I prefer this method with chicken. And #4: baked tilapia with garlic butter was my least favorite. I think I needed more sauce on top. It was fine but I didn’t love it.